I have mentioned before how I much I am lovin' yogurt lately. I usually eat it after my workout for a snack because of the high protein content! My latest yogurt snack is from a tasty company called Noosa Finest Yoghurt! Aussie-style Noosa Finest Yoghurt has a uniquely sweet/tart tang and thick, velvety texture that's incredibly decadent – and it comes with the added benefits of high protein and probiotics. Made on-site at the family-owned Morning Fresh Dairy in Bellvue, Colo., Noosa is blended in small batches and infused with clover alfalfa honey from Colorado’s Beeyond The Hive to give it the perfect sweet/tart tang. The yoghurt is available in nine indulgent varieties: New Tart Cherry, NEW Lemon, NEW Passion Fruit, Honey, Blueberry, Mango, Raspberry, Peach, and award-winning Strawberry Rhubarb. Noosa’s 100% natural fruit purees are made with the highest quality, best-tasting fruit on the market, and are free of artificial ingredients of any kind including flavors, colors and preservatives. What I love is that the milk in NOOSA is made from happy cows that graze on open pasture at least 90 days per year, and the rest of the time, dine on home-grown grain, silage and alfalfa to ensure the highest quality feed without the use of harmful pesticides. Morning Fresh milk is free of artificial growth hormones (rBGH) and artificial preservatives. 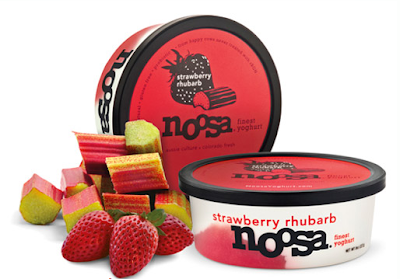 What I find most unique about NOOSA is the great selection of flavors - flavors I have never seen in yogurts before like Strawberry Rhubarb, Honey, Mango & Passionfruit! My favorite by far was the Strawberry Yogurt and Tart Cherry! These flavors are so real - not artificially sweetened and not artifically tasting! Just sweet, tangy and delicious! I truly enjoy every single serving of NOOSA I eat! Buy It: You can purchase Noosa Yoghurt at a local retailer near you! Win It: Noosa Yoghurt is generously offering (6) tubs of free Noosa to a lucky winner!